I installed the last driver to test all news features, but unfortunately it does not seem to work. My laptop is an Asus X550ui with a FX9830P and a RX460 4gb. - and last thing I tired : I used DDU to remove the driver, then I clicked on "Set Windows Device Installation setting to default" in DDU, and I wait for the installation. Windows update has automatically installed the driver "21.19.141.0" (the date is 04 October 2016), I rebooted the computer and after this I installed the driver 17.7.2. Still no change. 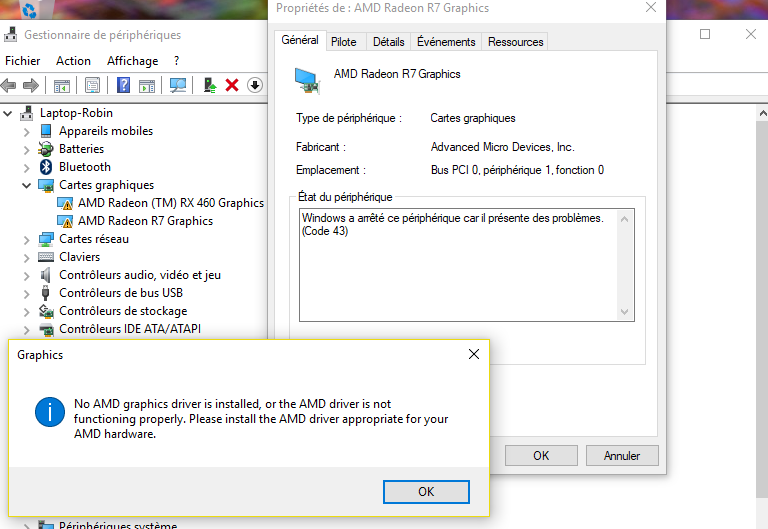 The message "Graphics" pop when I open Radeon setting, and the driver don't load, Windows only say that the device has a problem (code 43). Both the integrated card and the dedicated card doesn't load, so the screen resolution is low (800 x 600).